Last weeks disclosure of the 2013 US Nissan Leaf specifications left a large piece of information unsaid, the price. On Monday, at the North American International Auto Show, Nissan revealed that the entry level price had fallen a jaw-dropping 18%, or $6,000, to an MSRP of $28,800 for the newly-added S grade. This makes the 2013 Leaf the lowest priced five-passenger electric vehicle sold in the United States. Depending on location, and local government incentives, the effective price could be as low as $18,800. Because the 2013 Leaf S comes with a 3.3 kilowatt charger, a highly recommended option is the "Charger Package" upgrade that brings the charging rate up to 6.6 kilowatts and adds support for CHADEMO quick charging. That option costs $1,300 bringing the Leaf S's MSRP to $30,100. With the charger upgrade not only will Leaf owners have a better charge rate offering more driver flexibility, the CHADEMO fast charge will give an 80% recharge within 30 minutes. Nissan is continuing to offer an incentivized lease package with a price as low as $199/month for 36 months, which includes tax credits and destination charges. Because the Leaf qualifies for both Federal and State incentives, the price is effectively lowered. The $7,500 federal tax incentive gets applied to your 2013 taxes, which you'll be dealing with in early 2014. In California the CVRP rebate of $2,500 is applied at the time of purchase, and between those two the entry level price falls to $18,800,or $20,100 with the highly recommended charger upgrade. The 2012 Toyota Prius price starts at $24,200 for the Prius Liftback, $18,950 for the Prius c, $26,650 for the Prius v, and $32,000 for the Prius Plug-in. 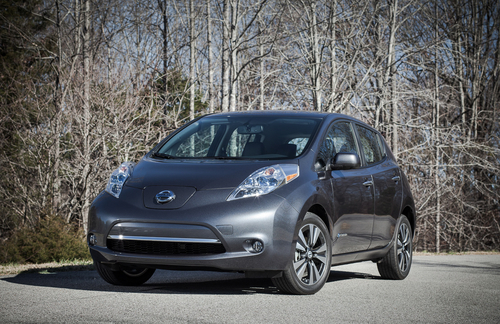 The improvements in the American 2013 Nissan Leaf over the 2012 model are fairly modest, but significant. The most important is the aforementioned 6.6 kilowatt charger that improves the effective driving range considerably. To implement the 6.6 kilowatt charger, Nissan relocated it to the front compartment (we can no longer call it the 'engine compartment') increasing the cargo space in the rear. Instead the major improvement for the 2013 model year Leaf is the radically lower price. That lower price is due to Nissan having "localized" production to North America, which puts the Nissan Leaf on a more favorable exchange rate footing than it had when all Leaf production was in Japan.